Set the recorded message you want callers to hear to let them know the call will now be transferred to your line. Follow the steps below to learn how to configure this setting. Under Connecting Message, click the Enable check box and then click Edit to modify. You can select between Default or Custom for your Connecting Message. 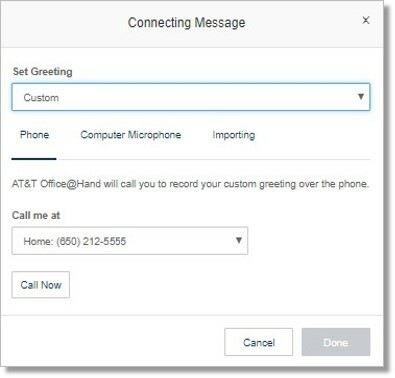 Phone – Selecting this option will let AT&T Office@Hand call you to record your custom greeting over the phone. 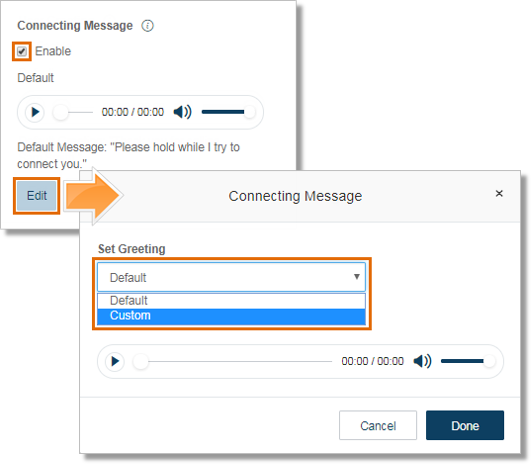 Computer microphone – Select this option when you want to record the greeting using your computer’s microphone. Note: Selecting any of the options will allow you to click Play to listen to your recording and click the Record button to upload a different file. You can also click the Download button to download a copy of the greeting. Click Save when redirected back to Screening, Greeting & Hold Music to confirm.